What does Kazakhstan’s new military doctrine reveal about its relations with Russia? Without much ado, Kazakhstan adopted a new military doctrine in September, replacing a 2011 document that had become dated. The new document states that Kazakhstan does not have enemies. Yet, Astana seems alarmed enough by Russia’s aggressive actions toward Ukraine since 2014 to have produced a doctrine that is an obvious reaction to Moscow’s hybrid warfare tactics, which include cyber-disruption and propaganda. Kazakhstan is not alone in sensing that it now lives in a rapidly changing security environment that demands new policies. Belarus, another neighbor of Russia, introduced a new military doctrine in July 2016. 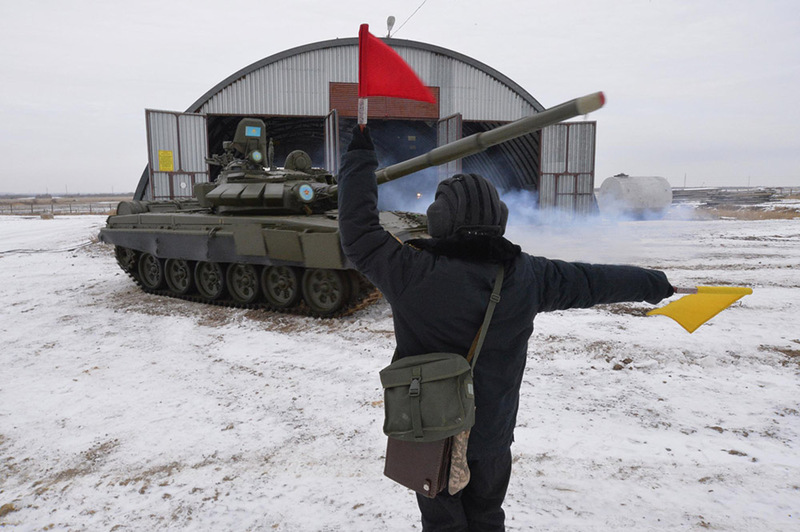 But while Belarus made explicit that it is reacting to Ukraine’s fight against Russian-backed separatists and Moscow’s use of hybrid warfare, Kazakhstani authorities have not commented publicly on changes to their military doctrine. Still, similarities between the new Kazakhstani and Belarussian doctrines abound, and it is not difficult to see the origin of Astana’s threat assessment. Kazakhstan shares a 7,500-kilometer land border with Russia and northern Kazakhstan is home to a significant Russian minority with deep roots in the region. Though their numbers are dwindling, Russians still account for roughly 20 percent of Kazakhstan’s population. Much to Astana’s irritation, the area is romanticized by some Russian politicians as still being Russian territory. In January 2017, a State Duma deputy, Pavel Shperov, suggested the Kazakhstani-Russian border was not a permanent fixture and that Kazakhstani territory was merely on loan to Kazakhstan. Kazakhstan pursues a multi-vector foreign policy with Russia, China and the European Union as its main partners. Balancing these relationships allow it to demonstrate that it has the political clout to act more independently of Russia than other Central Asian states. Still, Astana and Moscow remain very close allies, bound by economic ties through the Eurasian Economic Union and militarily through the Collective Security Treaty Organization, or CSTO, which also includes Armenia, Belarus, Kyrgyzstan and Tajikistan. The CSTO functions as much as a vehicle for Russia’s bilateral security agendas with fellow member states as it does as collective entity. As an organization, it has also redefined what it sees as security threats -- a process that began after the pro-democracy “color” revolutions in Georgia, 2003, Ukraine, 2004, and Kyrgyzstan, 2005. Analysis and recommendations from the CSTO played a pivotal role in shaping Russia’s own military doctrine of 2014, after the annexation of Crimea. The alleged basis of Russia’s actions in Ukraine is a self-proclaimed doctrine under which Moscow can act as the protector of the rights of Russians experiencing alleged discrimination wherever they may be. The circumstances that prevailed in Ukraine prior to the start of Russian meddling in 2014 are not evident in present-day Kazakhstan. Russia’s concern that Ukraine was drifting toward the EU’s orbit was an underlying motivation for its actions in 2014. There is no reason for Moscow to worry that Astana is tilting toward the EU these days. Meanwhile, the Russian minority in Kazakhstan experiences little or no discrimination. Just because the circumstances are different, doesn’t mean Kazakhstan isn’t vulnerable. Astana should recognize that national and ethnic unity since independence in 1991 is a thin construction, far too dependent on fealty to President Nursultan Nazarbayev. Kazakhstan’s new military doctrine is explicit about the risks to its borders and also the potential for an outside party to manipulate ethnic populations inside Kazakhstan. Alongside the outward-looking nature of Kazakhstan’s 2017 military doctrine, there is sharp focus on internal threats. Nazarbayev in the past three years has undertaken measures to strengthen the government, bolster the economy and to resist firmly any speculation that a Ukrainian scenario could happen in Kazakhstan. When citizens protested against plans to lease farm land to Chinese investors in May 2016, Nazarbayev issued a stark rebuke, using Ukraine as an example of what can go wrong if protests get out of hand. Nationalism is growing nonetheless. It not only showed itself during the May 2016 land protests, but also in long-term trends such as renaming previously Russian-language place names to Kazakh. Some Russian politicians see Kazakhstan’s move to Latinize the Kazakh alphabet, which is currently written in Cyrillic, as an anti-Russian move. It is indeed a highly symbolic gesture, one that a Western diplomat described as an act of defiance and post-Soviet national identity-building. The Russian language has equal status in Kazakhstan, but Kazakh is ascendant, and knowledge of it is required for government jobs. It’s also worth noting that not one of Kazakhstan's ministers has an ethnic Russian background. Astana has sought to manage its relationship with Moscow as an equal partnership. Its success in doing so is largely attributable to Nazarbayev, who has led Kazakhstan since independence. When the Soviet Union collapsed, Putin was a KGB functionarynt, while Nazarbayev was the already powerful and ambitious First Secretary of the Communist Party of Kazakhstan. With Nazarbayev turning 78 years old next year, a transition in the vast but sparsely populated Central Asian state is inevitable. The crisis in Ukraine has brought into focus the risks of any sort of transition or internal instability in Russia’s neighborhood. As Nazarbayev ages, political transition is inevitable and unless handled smoothly that transition could be destabilizing. The Kremlin’s military doctrine and its foreign policies are premised on Russia exerting itself as a great power with historical privileges. Kazakhstan understands that in the long-term it could be vulnerable to Moscow’s expansionist tendencies. Its new military doctrine addresses that external risk in a clear-headed and robust manner. But when it comes to the domestic challenges that could provide the very opening required for an assertive foreign power to gain a foothold, Kazakhstan still appears to be sleepwalking. Deirdre Tynan is Central Asia Project Director at International Crisis Group, the independent conflict-prevention organization. Tynan also serves on Eurasianet’s board. The opinions expressed in this commentary are Tynan’s own, and do not necessarily represent the views of ICG or Eurasianet.